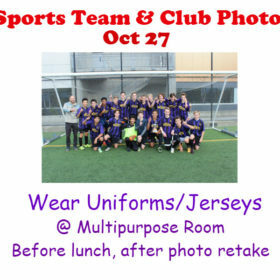 Team and club group photos on the morning of Thursday, Oct 27 in the Multipurpose Room. It will happen as soon as photo retakes are done and be finished before lunch. Yearbook asks that all clubs & teams plan for a group photo. The photos will go in the Yearbook. Wear your team uniforms or club t-shirts if you have them.